Head coach Jim Mora makes sure his team knows their fundamentals. "This is a helmet. Can you say helmet?" 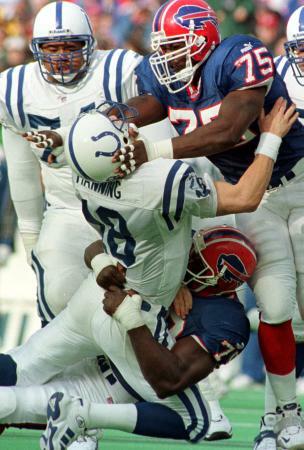 Marcellus Wiley of the Bills attempts to communicate with Peyton Manning via the Vulcan mind-meld. 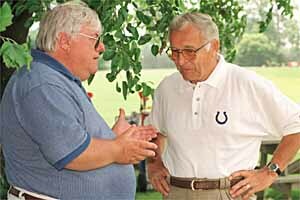 Colts play-by-play man Bob Lamey describes the lunch he just ate to Ted Marchibroda. 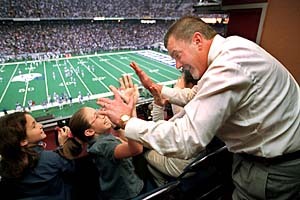 "I tell ya, Ted, the ribs were this big ..."
Always the gentleman, Colts owner Jim Irsay takes time out from his busy day to play a game of paddy-cake with a young fan. Back to page 1. | Back to page 2.